Whoo-hoo! I managed to get it done, just in time to link up with the OMG linky party over at Red Letter Quilts! 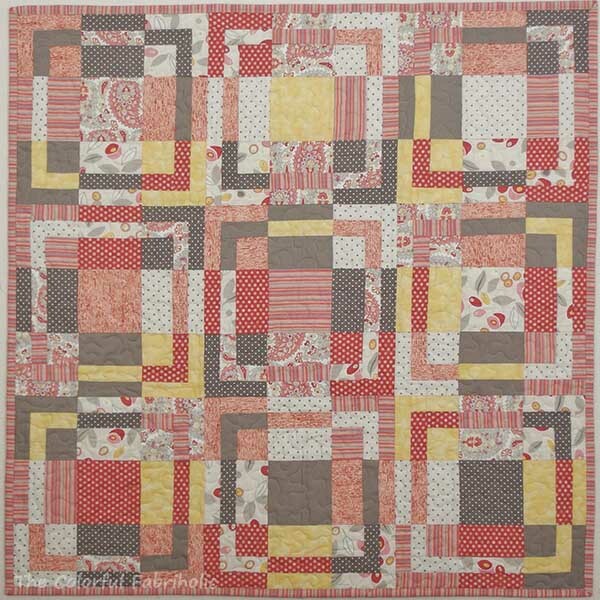 My priority goal for April was to get this Hands2Help quilt finished and bound, ready to send off to Happy Chemo. 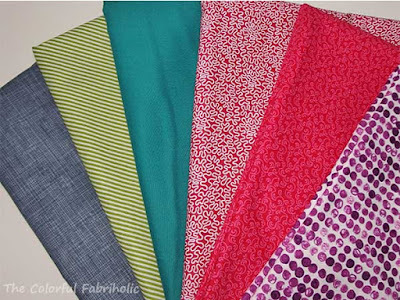 You can learn more about Hands2Help over at Confessions of a Fabric Addict. The black & tan quilt is lap size, 58" square before washing. The fabrics used were entirely from stash, including the backing and binding. 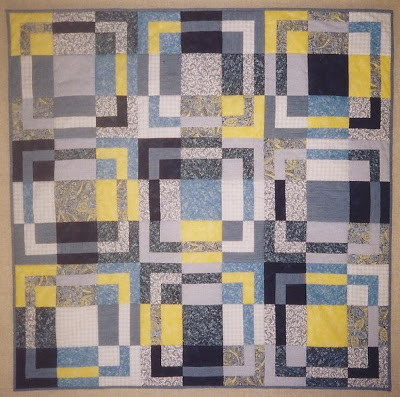 I quilted it on my domestic machine using the walking foot for SID around the sashing, and FMQ for a medium meander within the blocks. It's definitely not modern, but I've always liked this color combination. This quilt is ready to be sent off to Happy Chemo for H2H, and I hope it brings a little comfort to someone. I was bad. Very bad. But I had such a good time! 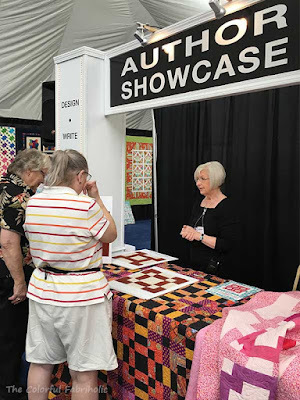 Not only did I have a good time acquiring stash all week, I got to hang out with friends, meet some of my blog readers, and share my Cut and Shuffle Quilts story with show attendees. It was a fabulous week! Me in the Author Booth. I may have gone a little overboard with the fabric purchases. I ended up adding 40-1/2 yards. My total amount spent breaks down to $6.28 a yard including the tax. 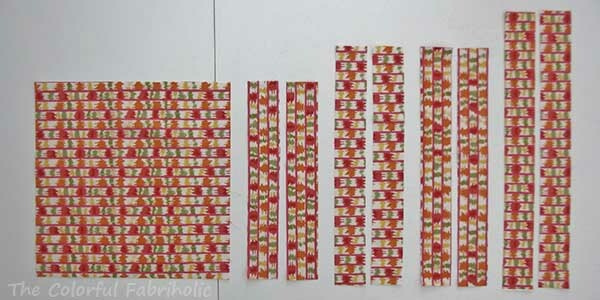 I'll take a hit to my stash report for those prices any day, if the fabrics are some that I like and can use. So, stash report: In this week: 40-1/2 yards. Out: 0. I may have a finish to count this coming week, so I'll tally up the totals for the month and the year at the end of the month. All right, enough with the words, now, let's get to the pictures! First up, some general stash enhancement. I didn't have a plan for specific purchases, but I looked over my stash ahead of time and took photos of some color groups that were lacking. I told myself I would not buy any orange or any green - my green basket overfloweth. 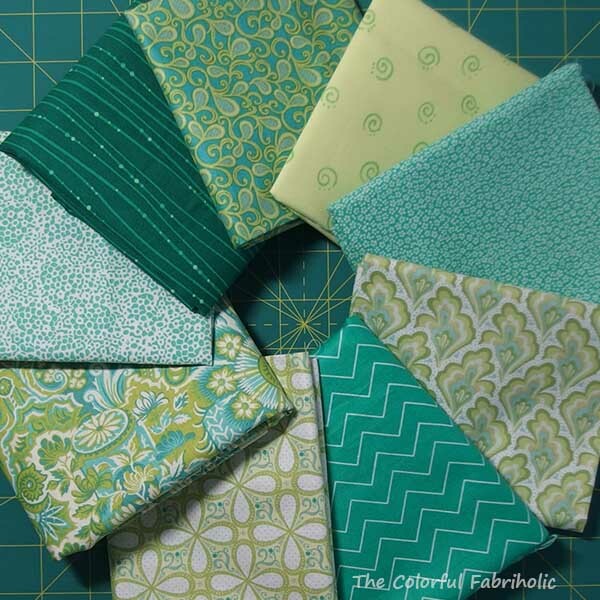 However, who can resist a bias stripe for bindings, and a half-yard of Kona teal at $3.97/yard? I'm lacking in blues so when blue was the color of the day, I found these. My friend thinks the one in the middle looks like a dress, which made me think of a Diane von Furstenberg wrap dress. On pink & purple day, I found some corals and magentas. 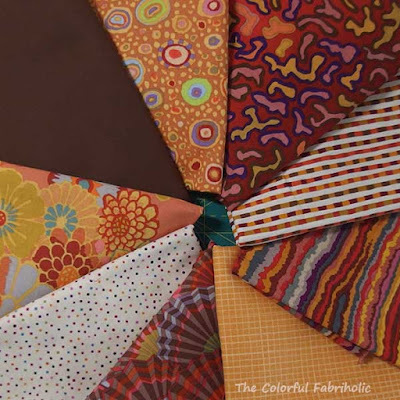 Each day, I found good stash basics and neutrals among the flat folds. I didn't clip swatches of anything and carry them with me as I shopped, I just chose what I liked. But somehow a palette emerged. So much for not buying any greens. That pale aqua on the far right is Tula Pink elephants. I did in fact buy some greens for a specific purpose. 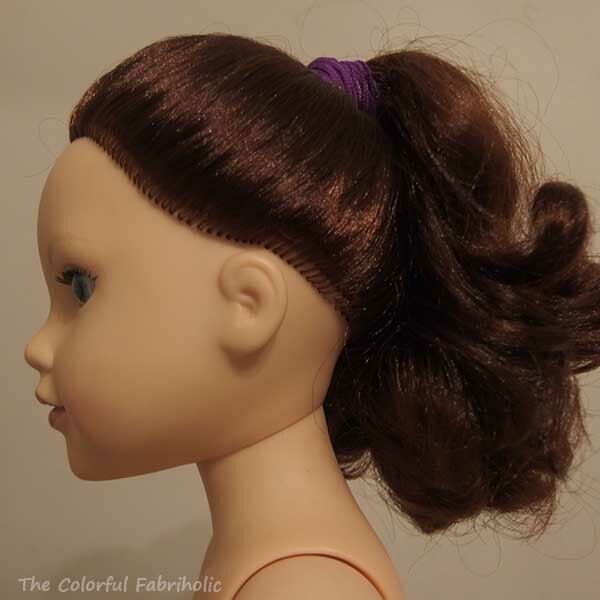 A deep accent color, because deep shades are hard to find. And four yards of backing for a planned project that I haven't even started yet. 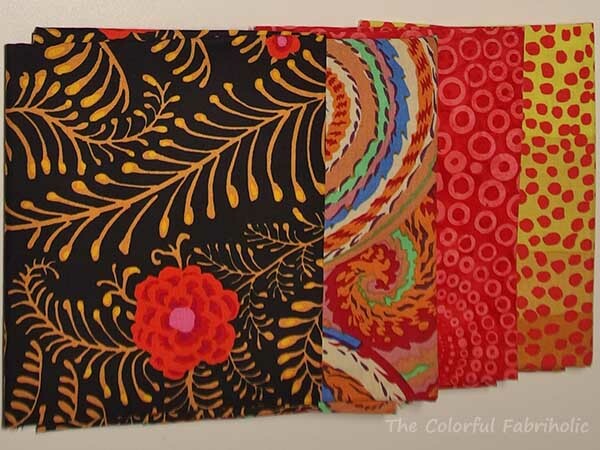 And who can resist the FQ packs at Nancy J's? Not me. The Kaffe & batik below called to me, as well as the pastel FQs in the sweet collection above. Last but not least, some Grunge and Painters Canvas. Most of these are for a planned project and a couple are just because I couldn't resist. That raspberry was too delicious to pass up! I treated myself to some non-fabric splurges, too. 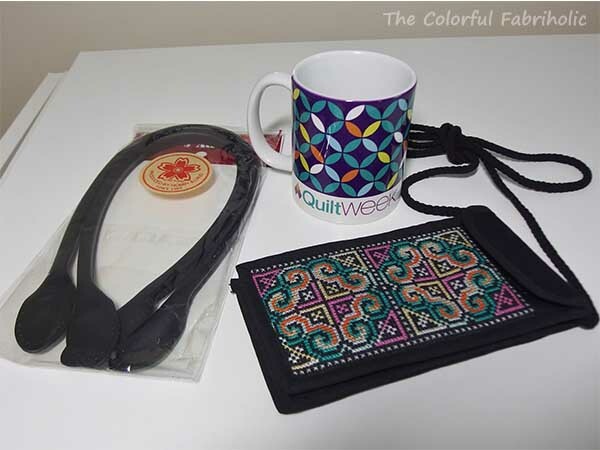 A replacement sunglasses case/wallet; a coffee mug, and handbag handles. All in all it was a great trip, and good karma was very much with us. Although rain was forecast for Weds. & Thurs., we never got more than a sprinkle and never had to open the umbrellas. No parking hassles. No major problems, and the little annoyances were either fixed or no big deal. My friend was even able to get a hotel reservation for next year already! But seriously, I think I did enough stash damage for awhile. 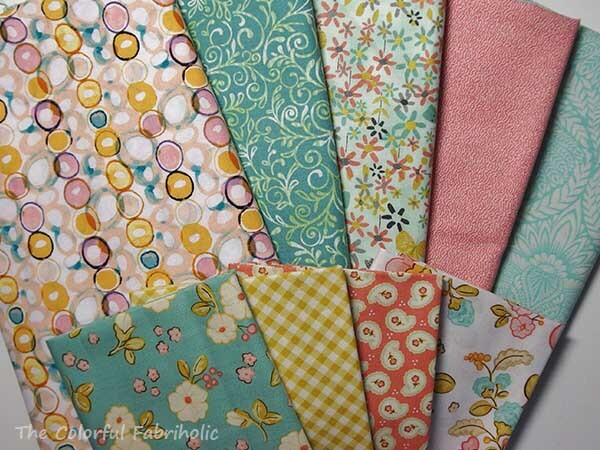 I'm going to have to get busy and sew up all this new fabric! Linking up with Patchwork Times and Molli Sparkles. 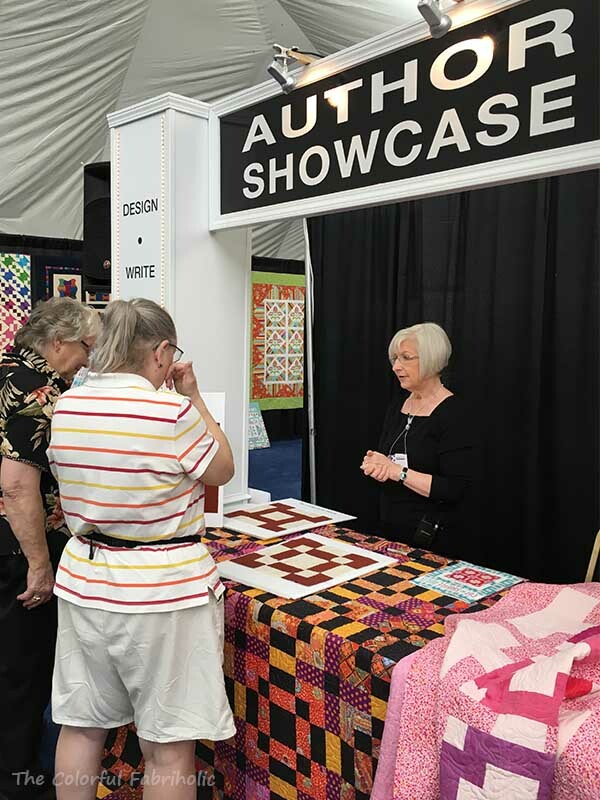 PS - We saw some beautiful quilts in the show, too, bit I didn't take pics. Ready to pin baste, which means some crawling around on the floor. And laying flat to reach the center. Ugh, my least favorite part of the process. I need to get this pinned today or tomorrow so I can get it up off the floor before I leave for Paducah. This quilt is destined for Happy Chemo, one of the Hands2Help charities this year, organized by Sarah at Confessions of a Fabric Addict. I had previously dedicated the quilt below to Happy Chemo as well. Then came a need within my own local bee, a young mother starting chemo here in STL. Should I send this quilt away to another city where it will be given to an unknown chemo patient, as publicly committed on my blog? Or should I give it to someone here that I know, for the same purpose? 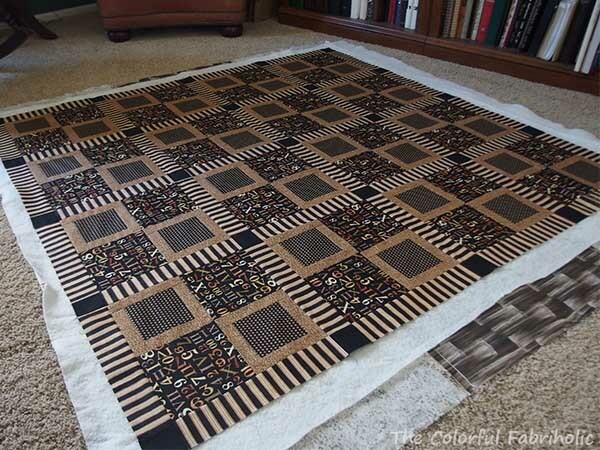 I emailed Sarah and asked her, and the quilt was given to my local friend. This is Positively Radiant, and while I know my friend not feeling exactly radiant right now, I hope the spirit uplifts her, and that she will eventually emerge from her ordeal healthy and radiant once again. 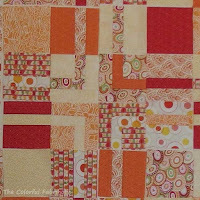 I'm linking up with Sarah at Confessions of a Fabric Addict for Hands2Help Progress, and with Judy at Patchwork Times for Design Wall Monday. If you're going to be at the AQS show in Paducah, I'd love to meet you! 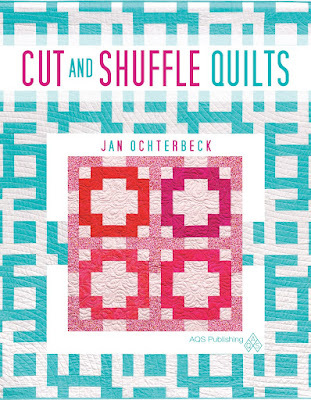 I'll be featuring my book Cut and Shuffle Quilts in the AQS Author Showcase, located in the bubble. I'll be demonstrating my Block Mama method from 4-6 pm on Thursday and 10 am-noon on Saturday. I'd love to meet readers of my blog, so if you can, please stop by and say hello! Nothing in this week. That's about to change - Paducah here I come! Out this week, 3 yards for the Framed Nine Patch sample. If you're going to be at the AQS show, I'd love to meet you! 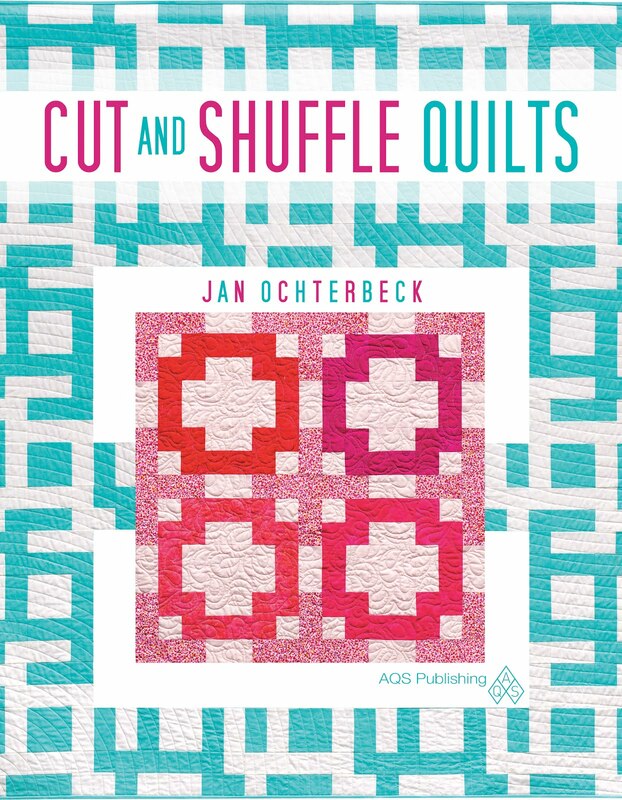 I'll be featuring my book Cut and Shuffle Quilts in the AQS Author Showcase, located in the bubble. I'll be demonstrating my Block Mama method from 4-6 pm on Thursday and 10 am-noon on Saturday. I'd love to meet readers of my blog, so if you can, please stop by and say hello! Welcome to Part 2 of my Framed Nine Patch tutorial. If you missed Part 1 and you’re interested, you can find it here. In Part 1 we covered fabric selection, cutting, and making the starter blocks. Today we’ll cover cutting apart the starter blocks, arranging the parts and making the top, adding optional borders, and finishing. We left off with nine starter blocks. Each starter block should measure 13-1/2” square. Accurate cutting is critical. This is definitely a case where you want to measure twice, cut once. If you make a cutting mistake, the starter block is ruined and you’ll have to make another. 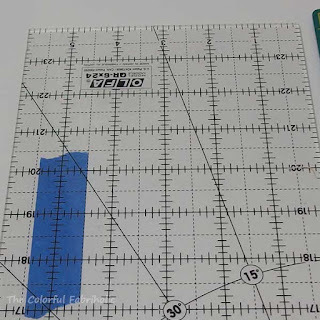 Since we’ll be cutting our 13-1/2” blocks into thirds, which is 4-1/2”, I recommend putting blue painter’s tape on your ruler at 4-1/2” wide, as a visual reminder of the correct measurement. 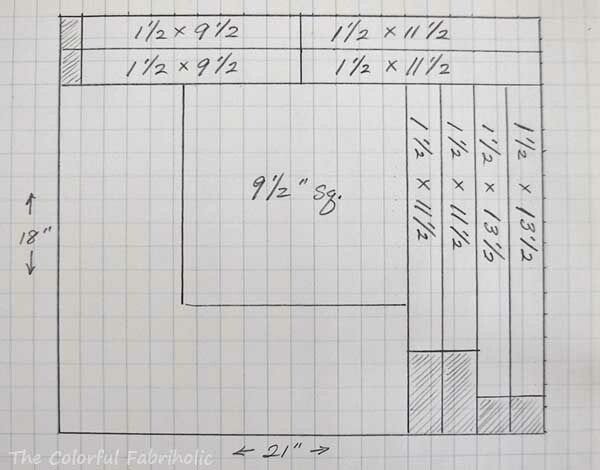 Note: If your blocks are not 13-1/2” square, you’ll have to fudge a bit when cutting them into thirds so that all your pieces end up the same size. I recommend cutting one starter block at a time and taping each block down to your mat to prevent any shifting. I don’t recommend stacking them and cutting more than one at a time because the lower layer(s) could shift. Second cut: 4-1/2” over from the first, which should also be 4-1/2” from the other side of the block. Rotate the cutting mat ¼ turn (do not move the block parts). Repeat the first cut and the second cut. The starter block should be cut into nine units. Repeat for each starter block. Here are mine, all cut and ready to lay out. 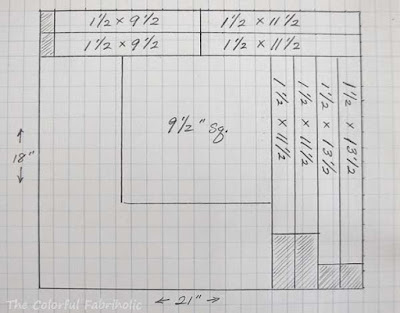 You will definitely need a design wall, floor, or other surface to lay the parts out on. Place the remaining units around the center patches so that they form framed nine-patches, scattering the colors as much as possible. Lay out three nine-patch blocks or nine units across and the same number down. Continue laying out units and moving them around until you like the placement. Here is how mine looked when they were first put on the wall. As I mentioned in Part 1, I was concerned about the two yellow fabrics looking too similar, and this would affect my layout. I tried to keep the two yellows from being right next to each other, but catty-corner is okay. o What I think needs to be changed: I want to separate the solid orange and the dark coral that are paired up next to each other. Too many of the darkest/strongest colors are together. Here’s my (almost) final layout. 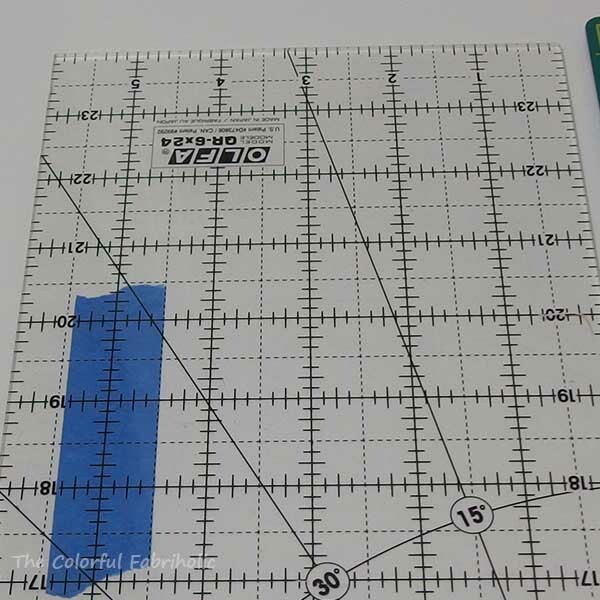 o Take photos of your layout progress. 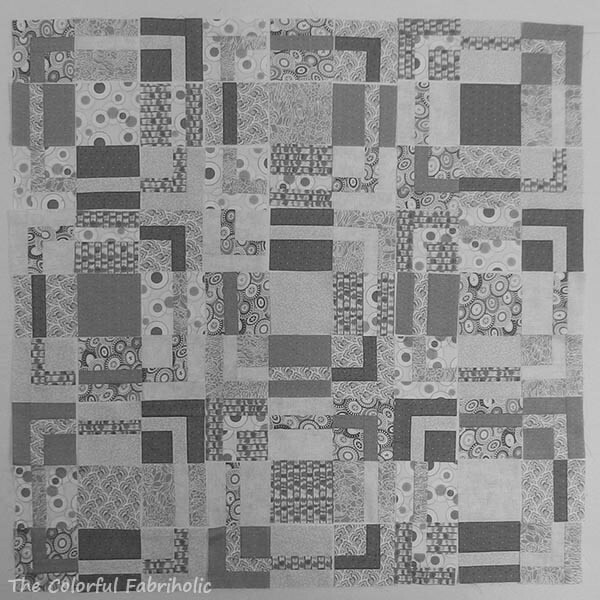 It’s good to check for value contrast in grey scale, and it’s also good to rotate your photo to see what the quilt will look like from other directions. I found a unit turned in the wrong direction when I was sewing the parts together. Check your layout and make sure your units all make framed nine patch blocks, with the frames all going in the correct direction. In some cases your seams will nest at the frames; in other cases they will not. I recommend pinning them carefully at the frames to prevent slippage and assure good matching. Regardless of which assembly method you prefer, blocks or rows, press your seams in opposite directions by row, so they'll nest together when you join the rows. If you’re not adding borders, your F9P top is now complete. Cut two of the border strips to this measurement. 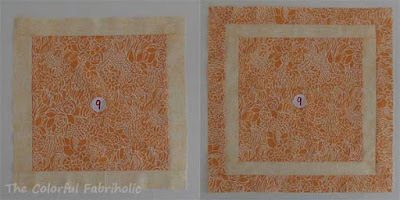 Attach these borders to the top and bottom of your quilt, pinning at the centers and the quarters. Cut the remaining two of the lengthwise border strips to this measurement. 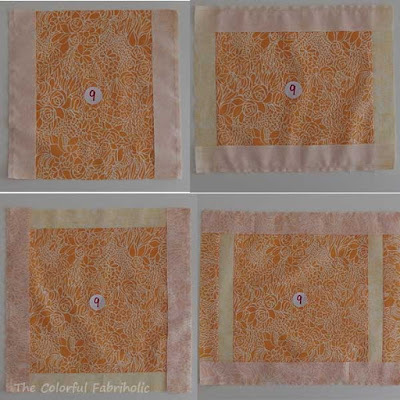 Attach these borders to the sides of your quilt, pinning at the centers and the quarters. Your F9P top with borders is now complete. 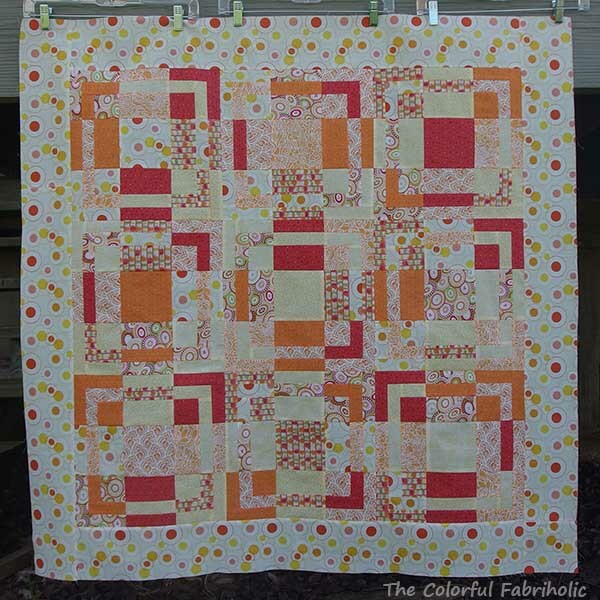 Layer, baste, and quilt as desired. 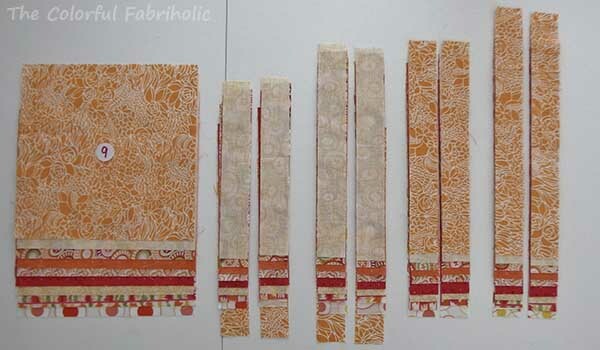 Cut 2-1/2” WOF strips of your binding fabric. 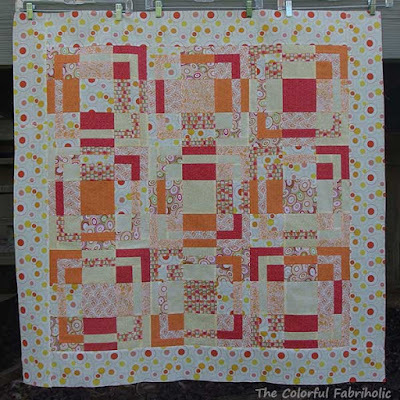 Join strips end-to-end, fold in half lengthwise, and press. Attach to quilt using your preferred binding method. Be sure to label your quilt! About this method: You never quite know how it's going to come out when you pull fabrics and make the starter blocks. This quilt came out quite busy, but it works. It's certainly cheerful! The dot print would not have been my first choice for borders, but I didn't have enough yardage of any of the other fabrics. I would have preferred the same light orange print (#9) that I featured in my demo block, which would have been much less busy and would have contained the madness a bit more. 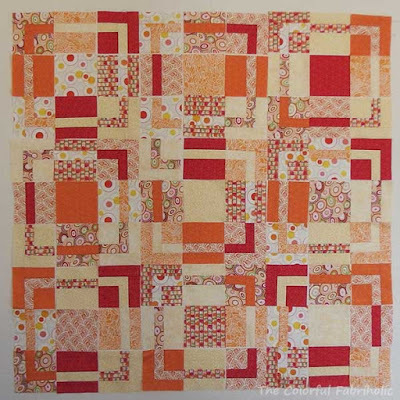 The Framed Nine Patch looks modern-ish to me, although modern quilting wasn't a thing yet when I first came up with the idea in 2004. 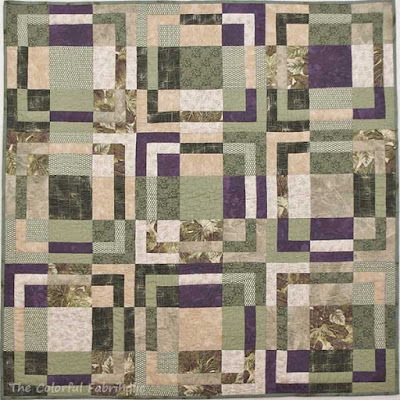 I think I'd like to try it in all solids with white....So many possibilities. If you make a F9P, I'd love to see it! Post it to Pinterest and send me a link! Linking up with Sew Fresh Quilts, Confessions of a Fabric Addict, and Crazy Mom Quilts. F9P parts on my wall. I've been playing with arranging the layout. Part 1 of the tutorial for my Framed Nine Patch is here (two posts below if you want to scroll down). Part 2 is coming Wednesday. Nothing in this week. Out this week: 3/8 yard for a doll dress. The doll came (naked) from Goodwill but she has obviously never been played with. I get to play with her make clothes and accessories for her until Christmas, then she'll go to my niece. 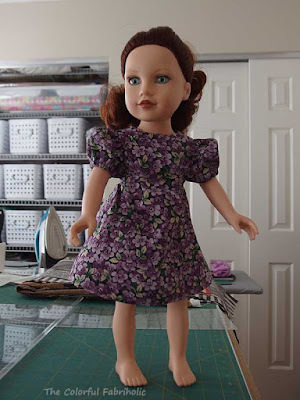 I cobbled together a pattern for the dress from commercial doll pattern parts and raided my purple stash for the fabric. My plan is to make one outfit or collection of accessories a month. 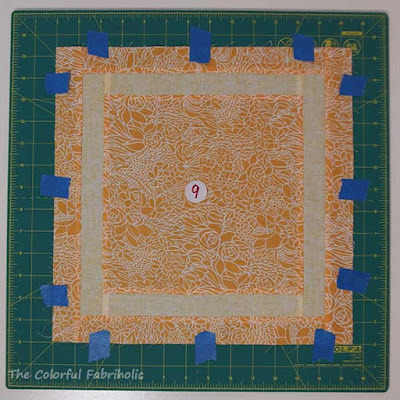 In other news, I posted Part 1 of the Framed Nine Patch tutorial last week; see previous post below. I'll post Part 2 on Wednesday 4/13. Part 2 covers cutting up the starter blocks, laying out & assembling the top, and adding borders. I hope you'll join me if you're interested! 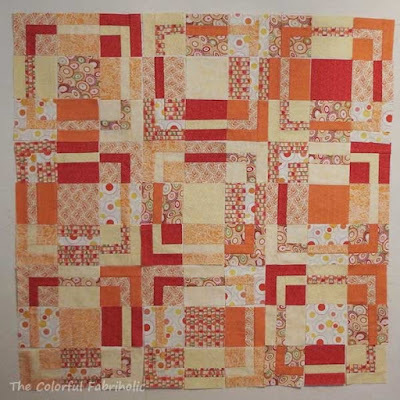 Linking up with Patchwork Times for Stash Report Sunday. 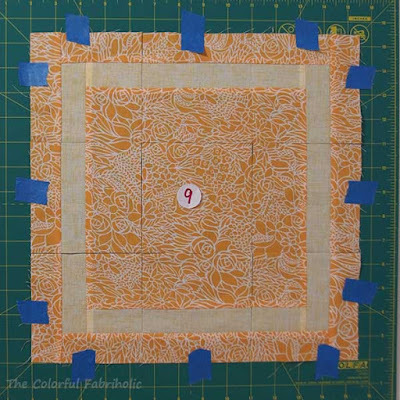 Welcome, and thank you to all those who expressed interest in my Framed Nine Patch (F9P) tutorial. 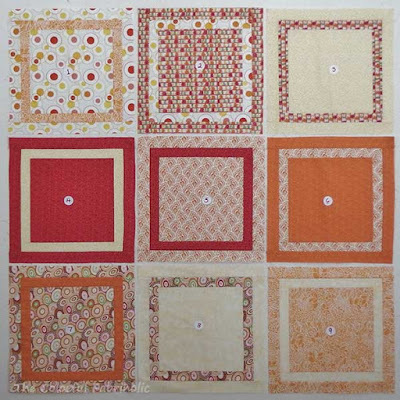 The Framed Nine Patch starts with large framed squares which are sliced and diced, and reassembled nine-patch style. Sound familiar? This concept was the precursor to my Cut and Shuffle Quilts. 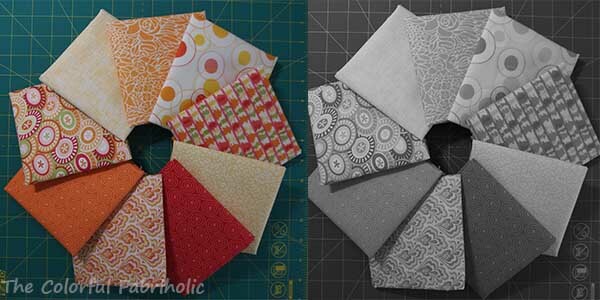 Today’s post covers fabric selection, cutting, and assembling the starter blocks. 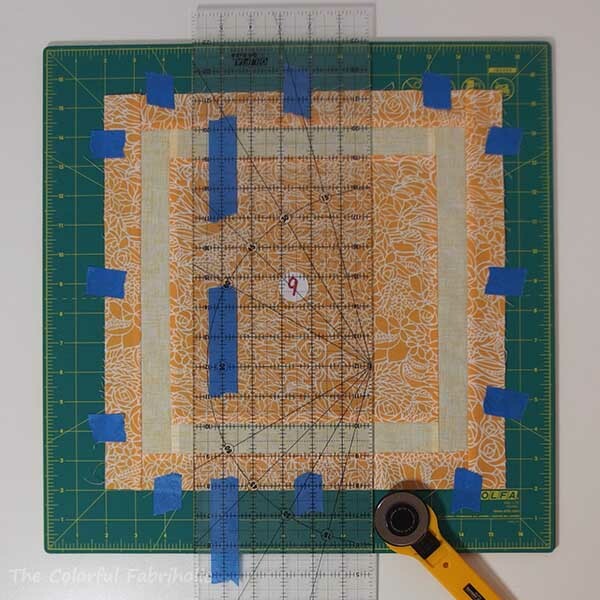 Next week’s post (April 13) will cover cutting up the starter blocks, laying out the pieces, reassembling the nine-patch blocks, and optional borders. 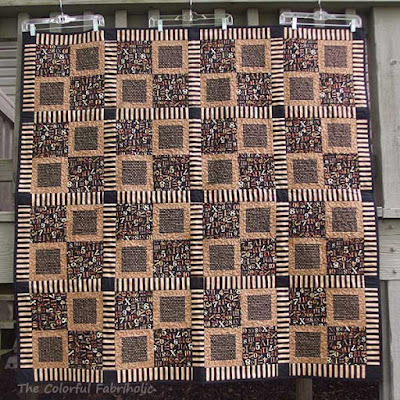 Finished Size: 36” square as shown, or 44” square including optional border. 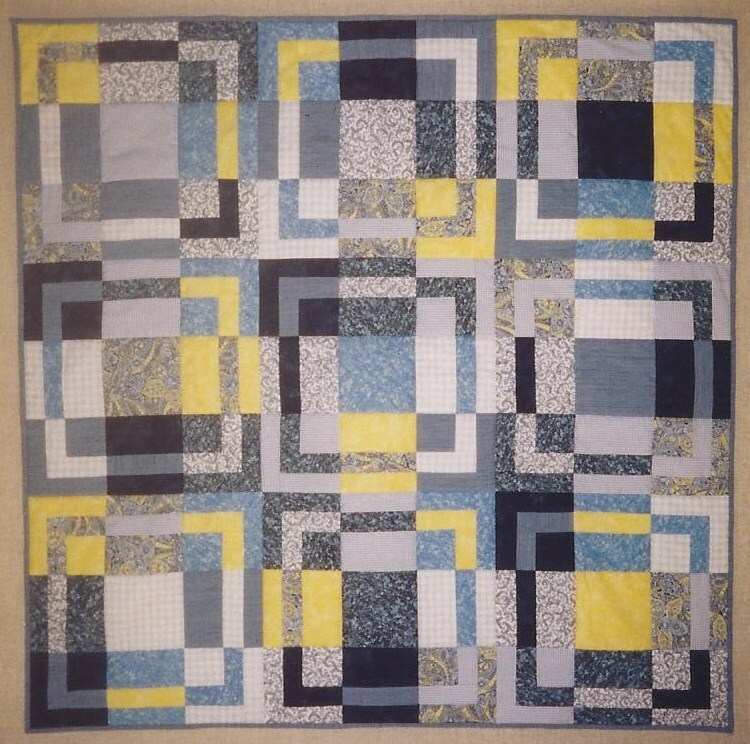 This is a small quilt, just baby size or table topper size. Skill Level: Confident beginner with experience in rotary cutting and in sewing straight, accurate, scant 1/4” seams. 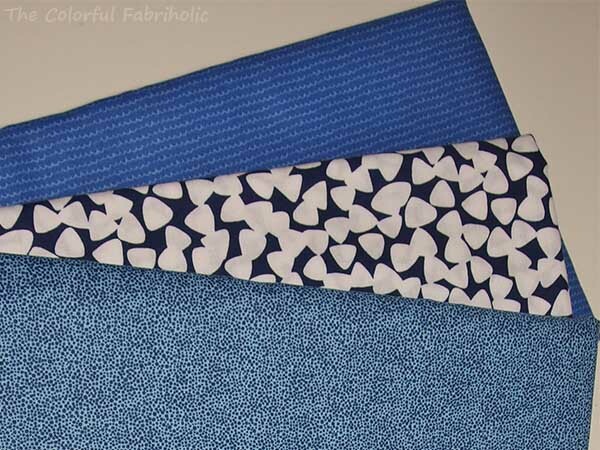 Fabric selection: The success of your F9P has a lot to do with the prints and fabrics you select. I’ve had some versions come out more successfully than others due to the palette I selected. Choose a mostly monochromatic or analogous color scheme. Make sure you have a range of values including one very pale and one very dark. 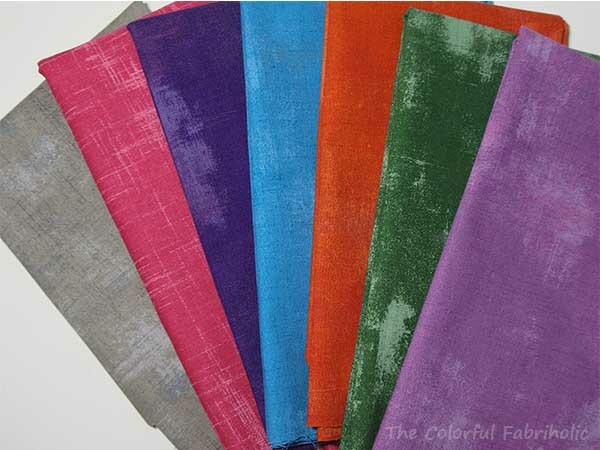 Have an accent color that contrasts with most of your fabrics in color and/or value. Your darkest fabric might serve as your accent color. Keep patterns small in scale. Include solids, near solids, and blenders more than focus prints. Quiet prints are better than bold ones. 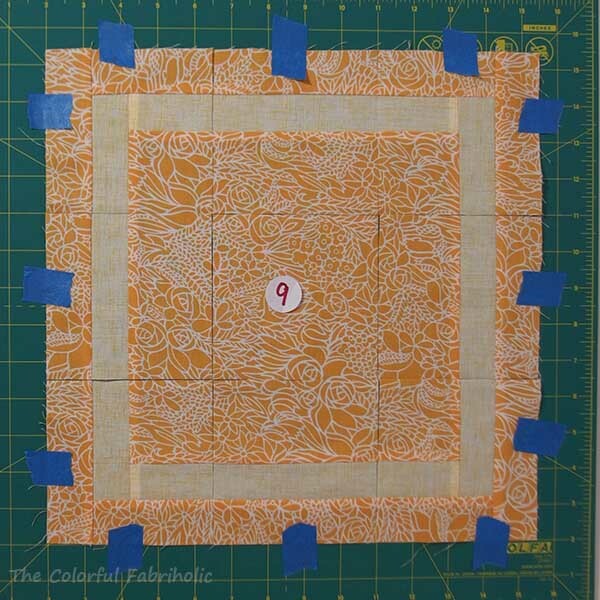 Keep in mind that directional prints may go every which way in the finished quilt. It’s mostly monochromatic except for the very dark accent of purple. There is a full range of values, including pale and deep. There isn’t very much pattern, and what pattern there is is mostly small scale. I like how the one leafy print keeps it from being boring. The overall palette is mostly monochromatic, but the yellow accent is a bit too bright. A softer yellow would have been better. There is not as much value contrast, so the overall look is muted and soft. 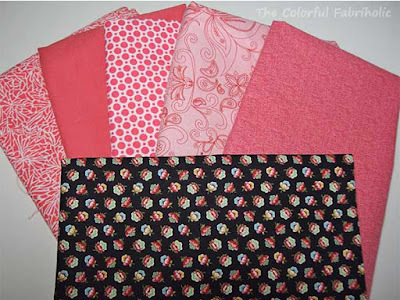 The darkest fabrics, two taupes and the coral dot, are mediums. This will be a gift for a baby girl, so the soft palette is okay, but the overall effect is not as graphically interesting as it would be with greater contrast. Analogous, ranging from blue-green to yellow-green. 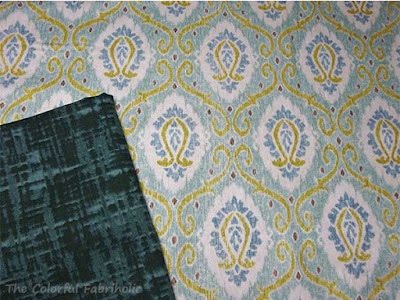 The dark green will stand out the most as the accent color, followed by the pale yellow green. Fairly small prints, but this may be a busy quilt with this much pattern going on. There are three directional prints: the stripe, the chevron, and the paisley. These might end up going every which way in the quilt. 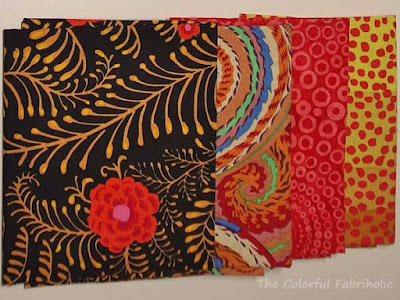 This palette would be my choice to make for the tutorial sample, but I don’t have enough of some of the fabrics. This is the palette I’ll use for the tutorial. 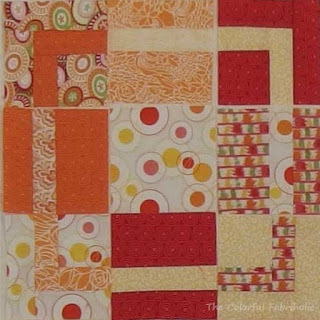 Analogous colors ranging from coral to yellow. Okay range of values; the coral reads dark compared with everything else and it will definitely stand out as the accent color, but like my latest F9P above, this palette doesn’t have a true dark. I’m a bit concerned about the two yellows being too similar; this may limit my options when laying out parts for the nine-patch blocks. Two directional fabrics, the paisley and the stripe, will end up going every which way in the final quilt. There’s a lot of pattern going on here; this will end up being a very busy quilt. I have enough of the circle dot to use it as the border; I don’t have enough of any of the other fabrics so the circle dot will have to suffice, by default. 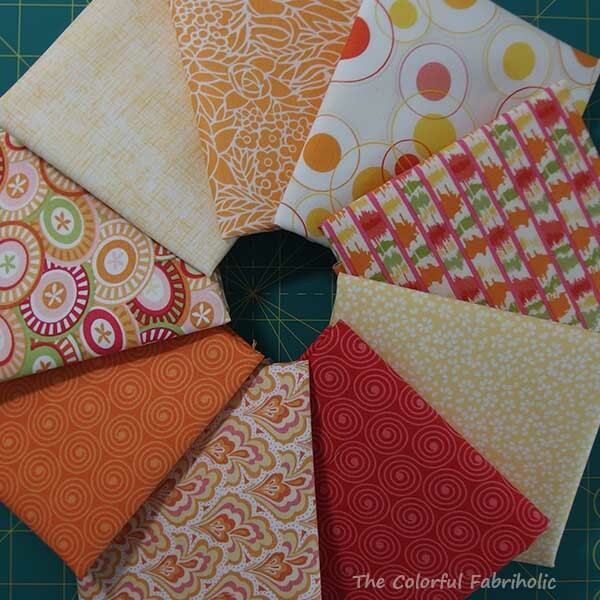 Analogous color scheme – yellows to orange. Good range of values including a very light and a very dark. Three directional fabrics: the dashed stripe, Jupiter stripe, and fans. Yikes, a lot of bold pattern!!! This will look very busy when assembled, maybe very choppy. Choose your fabrics with these thoughts in mind. Play with laying them out next to each other to see variations in value contrast and see how well you like them all together. Fabric Requirements: Prewashing all fabrics is recommended. Nine fat quarters (or 3/8 yard linear cuts). A linear quarter is not sufficient because the starter block requires a 9-1/2” square. Or seven FQs and see notes for border and binding fabrics below. You could replace one of those FQs with 1-3/8 yard, which would suffice for both the blocks and the border. Plan on cutting border strips first. 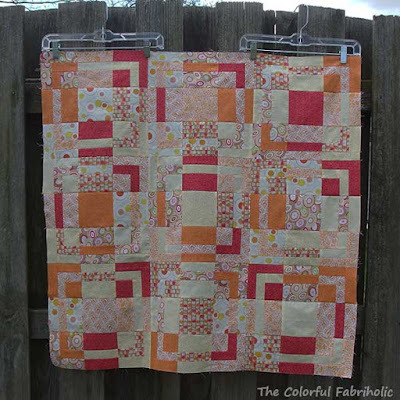 Or the border could be a 10th fabric. 3/8 yard. 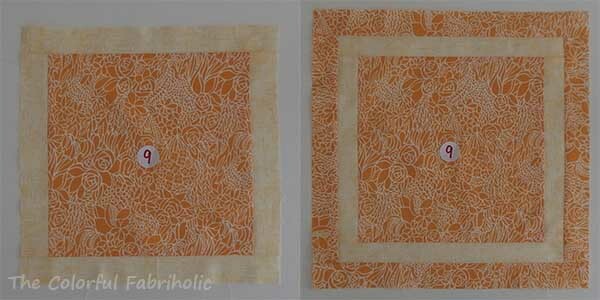 You could replace one of those FQs with 3/4 yard, which would be sufficient for both the blocks and the binding. For no-border option as shown, 1-1/4 yards. With border, piece the backing to measure about 50” x 50”, about 2 yards total. 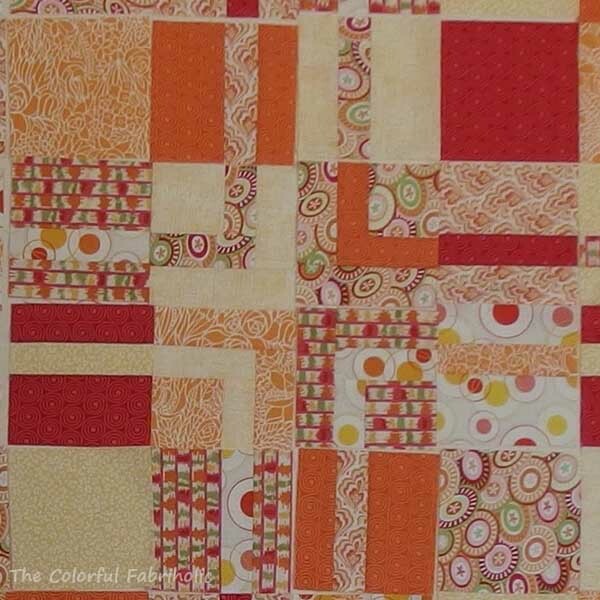 Optional border: Cut 4 (four) 4-1/2” wide lengthwise strips before cutting blocks. These will be cut to length later. If using a directional fabric, if you follow the FQ cutting diagram, you’ll be able to make your starter blocks with the fabric all going in the same direction. The direction may change later when you lay out nine-patch parts. Arrange your fabrics so there’s good contrast between one and the next. It may help to view them in a greyscale photo. Label your fabrics #1 through #9. Stack them up as shown: center squares, 9-1/2” strips, 11-1/2” strips, and 13-1/2” strips. 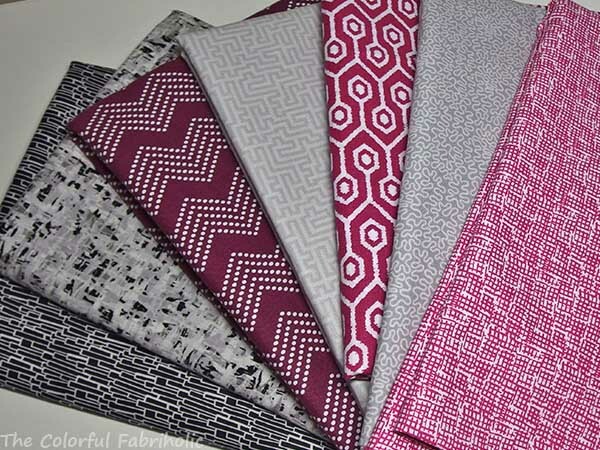 All stacks should be in the same order, with fabric #1 on the bottom and fabric #9 on the top. 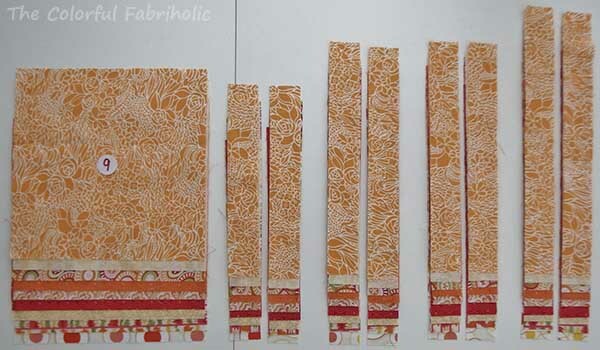 Take the top strip (fabric #9) from each of the 9-1/2” stacks and put it on the bottom of the stack. Do the same for the first two stacks of 11-1/2” strips. 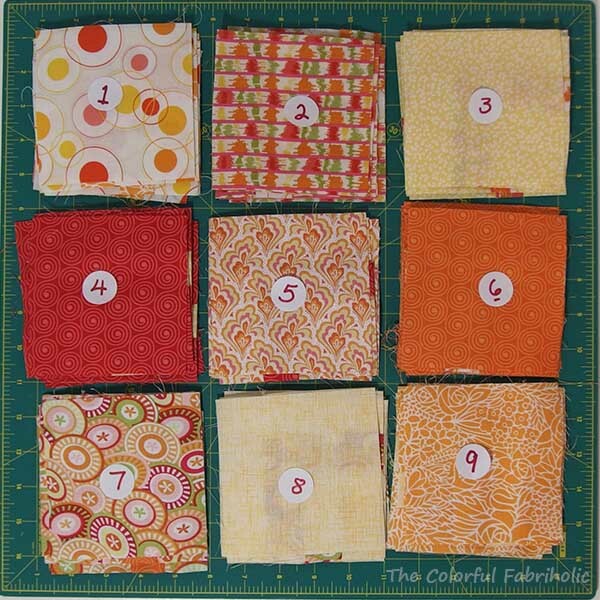 Keeping strips and stacks in order and using the top fabric in each stack, sew a 9-1/2” strip of fabric #8 to each side of the fabric #9 square. Attach 11-1/2” strips of fabric #8 to the top and bottom. 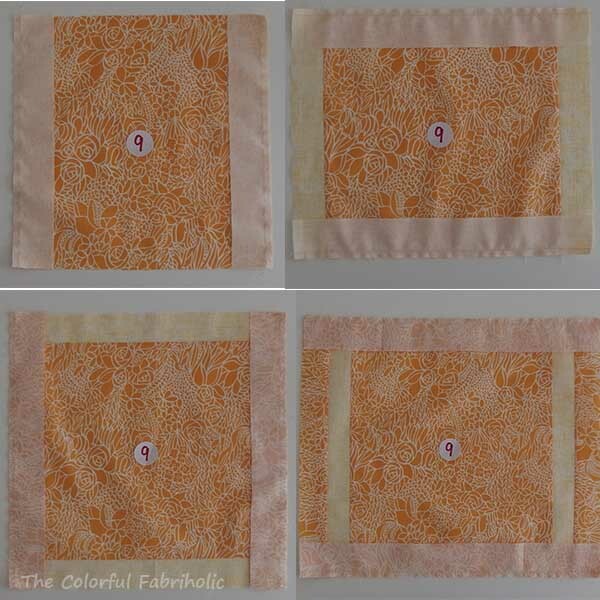 Sew an 11-1/2” strip of the same fabric as the center square (#9) to each side of the framed square. 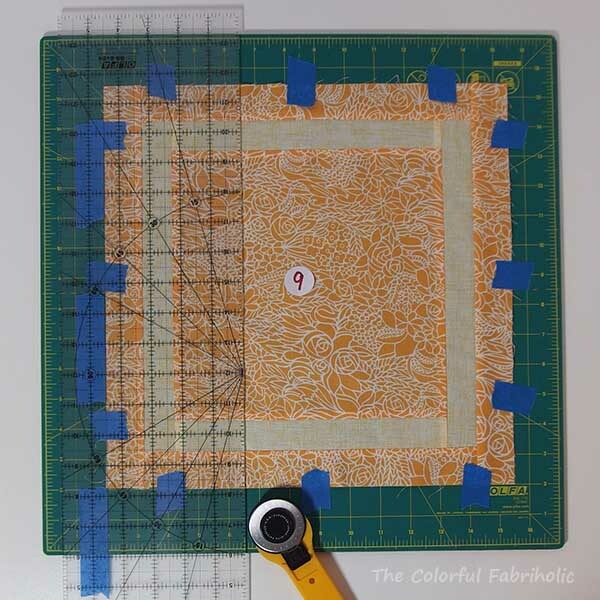 Sew a 13-1/2” strip of the same fabric as the center square to the top and bottom of the framed square. add side strips, second frame; add top & bottom strips, second frame. Repeat for each starter block. I recommend first attaching the first strips to the center squares, keeping careful attention to which strip gets attached to which square. Strip fabric #8 is sewn to center fabric #9. Strip fabric #7 to center fabric #8; etc. down to strip fabric #9 to center fabric #1. Once you have the correct first strip in place, you can chain piece all the other strips. The strips in the first frame all match the first strip. The strips in the second frame all match the center square. Left: center with first frame; right: with second frame. Second frame always matches center square. You now have nine framed starter blocks complete. Next week we’ll cut these starter blocks into pieces, lay them out, and reassemble them. 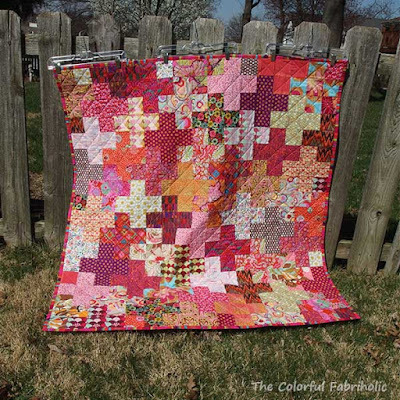 Meanwhile, I’m linking up with Let's Bee Social over at So Fresh Quilts and Whoop Whoop Friday at Confessions of a Fabric Addict. Nothing actually on my design wall today, but I do have several projects in the works. First up, I'm preparing a tutorial for my Framed Nine Patch quilt. I'll post part 1 on Wednesday Apr. 6, and part 2 on the 13th. Part 1 will cover fabric selection, cutting, and making the starter blocks. Part 2 will cover cutting up the starter blocks, rearranging the parts into nine-patch blocks, and adding optional borders. I hope you'll join me! Another priority for me this week is to make new Cut and Shuffle Quilts block samples for Paducah. I'll be demonstrating my Block Mama method in the AQS Author Demo booth on Thursday from 4-6 pm and on Saturday from 10 am-noon. If you're going to Paducah, please come say hello - I'd love to meet my readers! And not quilt related, but still sewing fun, I'm making doll clothes. My SIL has been encouraging me to check out the toys, etc. at the local Goodwill store. So I went last week, and although they didn't have anything I wanted for grandson CJ, I did find a doll I couldn't resist. 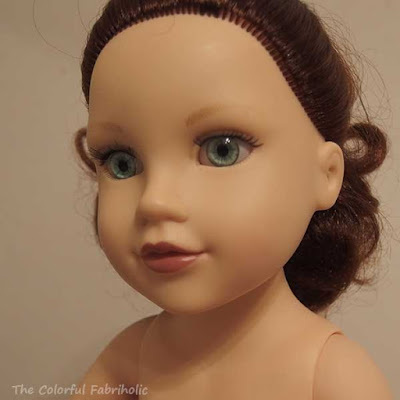 She's an 18" doll similar to American Girl, in excellent condition, never played with, but no clothes or shoes. $4. I'll make clothes and accessories for her and give her to my great niece for Christmas. Isn't she pretty?! My plan is to make one outfit or accessory set a month between now and Christmas. I get the enjoyment of playing with dolls and doll clothes, and then Maddie will get a new doll with a great wardrobe. Win-win! Linking up with Judy at Patchwork Times - check out other quilters' actual design walls over there.